JOONDALUP bounced back emphatically from its first loss of the season to defeat Cockburn by 30 points in State Basketball League action on Friday night. The league leaders defeated the 11th-placed Cougars 95-65 at HBF Arena. The Wolves will look to strengthen their hold on top spot with two wins from a double header this weekend against East Perth on Friday and Rockingham on Saturday, where they could come up against former club champion Greg Hire. Against Cockburn, the Wolves did not pull away until the second half, with the visitors starting well to lead by four points at quarter-time and trail by just a point at half-time. But the Wolves restricted them to nine points in the third quarter and 24 for the half while piling on 53 points themselves. It was the first time for ex-Cougars big man Jalen Billups to play against his old team and he top-scored for the Wolves with 17 points and seven rebounds on 8-13 shooting. 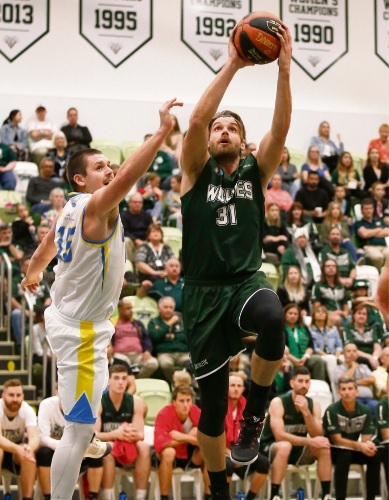 Chris Clausen added 14 points and three rebounds for the Wolfpack, while Damian Matacz finished with 10 points and eight rebounds. Brian Sullivan had seven assists. In the women’s clash, the sixth-placed Lady Wolfpack returned to the winner’s list with a 69-59 win over the ninth-placed Cougars. Joondalup’s Nikita Martin once again top-scored with 20 points and four rebounds. Amy Kidner added 13 points and six rebounds with Chelsea Belcher contributing 10 points and Ellyce Ironmonger 17 rebounds.